Hello everyone! Today I wanted to share with you one of my favorite manicures that I've done lately. In only 9 short days, the beginning of Spring will officially be here and it cannot get here quickly enough, am I right? I am absolutely excited and ready for Spring to happen so in lieu of the seasons changing, I am preparing myself from tips to toes in anticipation starting with my unofficial Spring color, Essie Where's My Chauffeur? accented with Beyond Cozy to give it a hint of trendy liveliness. Ever since I first fell in love with Tiffany & Co-esque blue on the nails over four years ago, it's been one of my favorite shades to wear during the warmer months because it brings such a carefree personality to the hands. It can be a little challenging to find the right turquoise to play off your skintone without making it look dull (happens often with blues) but I must say I am loving this one! For the ring finger I applied Essie's Beyond Cozy which I was in love with from the moment I laid my eyes on it. Worrying it could be your typical semi-opaque glitter topper, I applied it over the turquoise base but it's actually very dense and would've been wonderful in 2 coats on a bare nail as well. I'm very impressed with just how gorgeous and opaque it applies and can't wait to use it again! 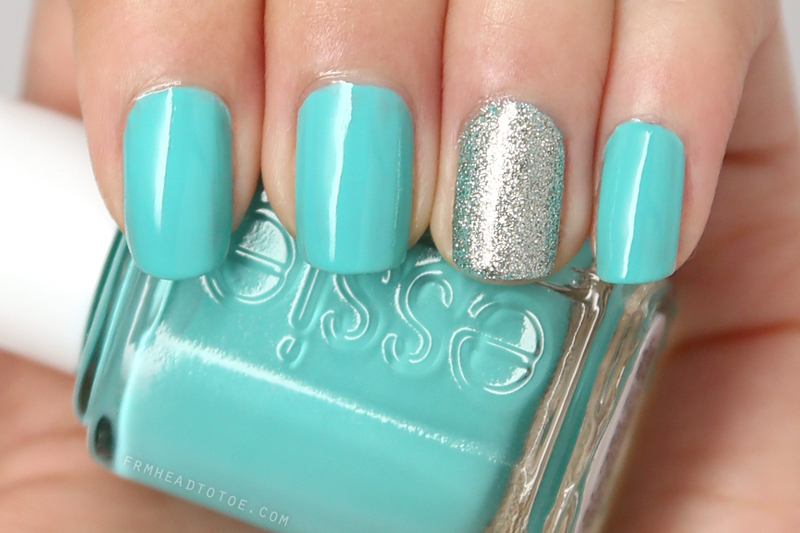 PERFECT accent nail polish with this color! Readers, do you have a favorite Spring nail color? Do you like to paint an accent nail a different shade? Let me know in the comments! i'm so getting at soon as I can! I just bought Sephora's pantone color of the year. It's green/blue and perfect for the spring/summer! I love this Tiffany inspired look! I love this color combo...it looks like gift wrapping from Tiffany's, not that I really know what that looks like, never got anything from there, lol. Lately we have been loving wearing a combo of glitter and solid colour on our nails! This colour makes me think of summer ! Favorite Spring color: pastel colors and light creamy brown. The colour combo is so pretty! Reminds me of Tiffany, I love it! Jen, you like so much nail polish, you should know about the brazilian nail polishes. Here in Brazil the price is very low (about R$2,50 = U$$ 5,00 or less, and we know that doesn't happen in other countries) and the brands are very respected. This 4 brands here are the most famous and used. Search on COLORAMA, RISQUÉ, HITS and IMPALA nail polish. Can u review the new CC cream (upgraded BB cream)? I am curious what are the differences. Love this color combination!!!! <3 Really elegant!